Virginia Gov. Ralph Northam defiantly refused to resign Saturday and denied that he was in the racist yearbook photo that led to widespread calls for him to step down immediately. The photo, which was revealed on Friday, shows two men, one in a full Ku Klux Klan robe and hood and another in blackface, on Northam’s medical school yearbook page in 1984. Northam graduated from Eastern Virginia Medical School. “Yesterday I took responsibility for content that appeared on my page that was clearly racist and offensive. I will not excuse the content of the photo. It was offensive, racist and despicable. I was seeing it for the first time. I was unaware of what was on my page. 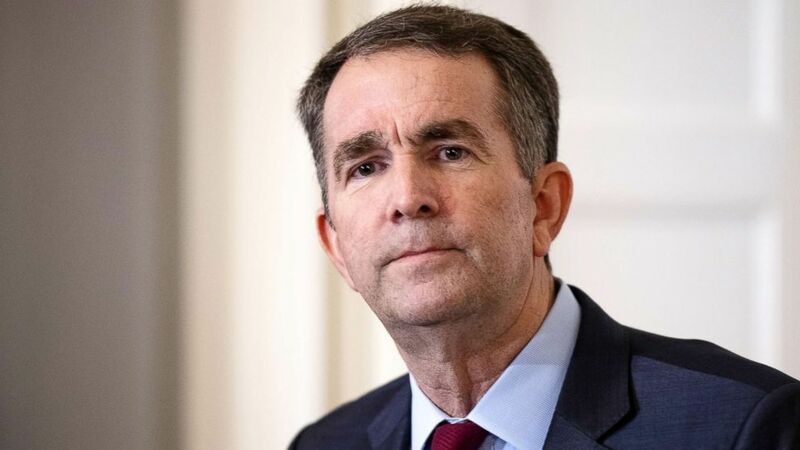 I was appalled that they appeared on my page,” Northam said at a lengthy press conference at Virginia’s Executive Mansion. “I believe now I am not either of the people in that photo. It is disgusting, offensive, racist,” Northam said. As recently as Friday night, Northam admitted that he was in the photo and apologized for it. But on Saturday, he reversed his earlier statement and said he was not in the photo. He said that he never bought the yearbook and had never seen the page before the news broke on Friday. He did not specify on Friday whether he was the person photographed in the KKK robe or the one in blackface. But with his wife, Pam, at his side, he admitted the sudden about-face may strain his credibility. He said he wanted to address the “hurt” and apologize right away. Sporting a glove, shoes and “a little bit of shoe polish on my cheeks,” the governor said he won the contest. He never did it again, he added. Northam also categorically denied any association with the Ku Klux Klan. “There is no way I have ever been in a KKK uniform,” Northam said. “What I really want to do is talk about the racism and discrimination that I have fought against,” he said. Earlier Saturday, a source close to Northam, who requested not to be named because of the sensitivity of the situation, told ABC News that Northam had been calling friends from medical school in an attempt to identify the men in the picture. During the press conference, the Democratic National Committee (DNC) released a statement calling on Northam to resign. The statement echoed an earlier call from the Democratic Party of Virginia on Saturday that Northam should step down immediately and be replaced by Fairfax. The Virginia Legislative Black Caucus also renewed its call for Northam to resign. “He had irrevocably lost the faith and trust of the people he was elected to serve. Changing his public story today now casts further doubt on his ability to regain that trust,” the caucus said in a statement. North Carolina Gov. Roy Cooper, also a Democrat, released his on statement on Northam. Gina Raimondo, the head of the Democratic Governors Association and governor of Rhode Island, said she wanted Northam to resign. “It is time for Gov. Northam to resign and allow Lt. Gov. Fairfax to lead Virginia forward,” she said. ABC News’ John Verhovek contributed to this report.